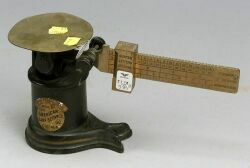 Four Cast Iron Postal Scales, comprising a Howe with 4 pound arm, marked Property of U.S.P.O. 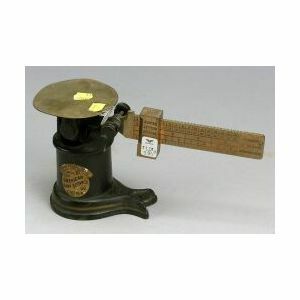 Dept., a Foyer Postal Scale by The American Bank Service Co., Chicago, with brass arm divided for various types of mail, a small Fairbanks and a equal arm balance and weights marked Canadian G.P.O. (General Post Office), ht. 14 in.